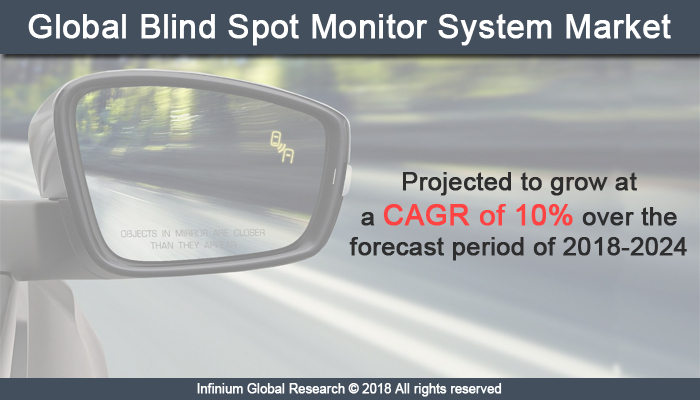 A recent report published by Infinium Global Research on blind spot monitor system market provides an in-depth analysis of segments and sub-segments in global as well as regional blind spot monitor system market. The study also highlights the impact of drivers, restraints, and macro indicators on the global and regional blind spot monitor system market over the short term as well as long term. The report is a comprehensive presentation of trends, forecast and dollar values of global blind spot monitor system market. According to the report, the global blind spot monitor system market is projected to grow at a CAGR of 10% over the forecast period of 2018-2024. Blind spots are the area around a vehicle that is unnoticeable to the driver of the vehicle. The Blind spot monitor system is a sensor based detection system, mainly used to monitor the car’s flanks at the rear and side of the driver/vehicle. Blind spot system monitors those blind spots and informs to the driver in the form of light, audio, vibrating or tactile on the relevant side of the vehicle. Thus, blind spot monitor alerts the driver in advance thereby preventing the vehicle collision. Blind spot monitor system is equipped either with Camera or radar sensors and are either located underneath or at the corner of each side mirror. Some systems also include bumper-mounted sensors. Several manufacturers used advanced technologies in both passenger and commercial vehicles in order to provide convenience and safety features to the customers. Blind spot monitor system provides comfort-ability and comfortable driving experience to the driver. With rising consumer demand for safety solutions, the demand for the blind spot monitor system is increasing. Moreover, growing awareness and government regulatory policies about road safety are expected to boost the blind spot monitor market. Besides this, increasing sales of the passenger, as well as commercial vehicles, is indirectly expected to boost the sales of the blind spot monitor systems. However, the high cost of technology and non-availability of the system in small and economy hampers the growth of blind spot monitor system. Concerns about passenger safety and availability of cost-effective sensors are providing opportunities in blind spot monitor system. In addition, global manufactures show interests in self-driving vehicles that will further create more opportunities for the blind spot monitor market. Geographically, Europe region held the largest market share in the blind spot monitor system market, followed by the Asia-pacific region. Countries like Germany, UK, and France are the dominant countries in Europe region that have increased the growth of the blind spot monitor market due to increased sales of luxury and premium vehicles. Besides this, the increasing popularity of blind spot monitor system has resulted in increased adoption of blind spot monitor system market. In terms of revenue, North America and the Asia Pacific are the second and third leading regions. The APAC region is expected to grow at the highest CAGR during the forecast period. The growth in this region is mainly attributed due to rising disposable income and increase sales of premium and luxury car segments. The report on global blind spot monitor system market covers segments such as technology, vehicle type, and end-user. On the basis of technology, the global blind spot monitor system market is categorized into active blind spot monitoring and passive blind spot monitoring. On the basis of vehicle type, the global blind spot monitor system market is categorized into passenger vehicles and commercial vehicles. On the basis of end-user, the global blind spot monitor system market is categorized into original equipment manufacturers and aftermarket. The report provides regional analysis covering geographies such as North America, Europe, Asia-Pacific, and Rest of the World. In this section, the key trends and market size for each geography are provided over the period of 2016-2024. The countries covered in the North America region include the U.S., Canada, and Mexico; while the Asia-Pacific region includes countries such as China, Japan, India, South Korea, Malaysia, and among others. Moreover, Germany, U.K., France, Spain, and Rest of Europe are the major markets included in the European region. The U.S. drives the growth in the North America region, as it is the largest market in the region. In the Asia-pacific region, rapid industrial growth in India and China offer substantial potential for the growth in the blind spot monitor system market. As a result, the APAC region is projected to experience growth at a CAGR of x.x% over the forecast period 2018-2024. The report provides profiles of the companies in the global blind spot monitor system market such as Continental AG, Delphi Technologies, DENSO CORPORATION., Autoliv Inc, Magna International Inc., WABCO, Robert Bosch GmbH, Mando Corp., Mobileye, and HYUNDAI MOBIS. The report provides deep insights into the demand forecasts, market trends, and micro and macro indicators. In addition, this report provides insights into the factors that are driving and restraining the global blind spot monitor system market. Moreover, The IGR-Growth Matrix analysis given in the report brings an insight into the investment areas that existing or new market players can consider. The report provides insights into the market using analytical tools such as Porter's five forces analysis and DRO analysis of blind spot monitor system market. Moreover, the study highlights current market trends and provides forecast from 2018-2024. We also have highlighted future trends in the blind spot monitor system market that will affect the demand during the forecast period. Moreover, the competitive analysis given in each regional market brings an insight into the market share of the leading players. This report will help manufacturers, suppliers, and distributors of the blind spot monitor system market to understand the present and future trends in this market and formulate their strategies accordingly.